Learn to make Coastal Shrimp Curry with Mukti. Come join us! Healthy and delicious is always appealing to everyone’s palates. There are many secrets to a make a healthy yet delicious dish, and you will learn those secrets in my kitchen. 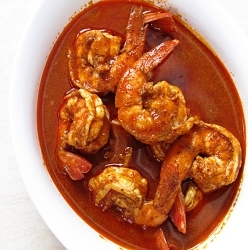 For my Secrets of healthy Indian Cooking class, the main dish of this class will be coastal shrimp curry. Coastal shrimp curry is easy to cook: fresh shrimp cooked with aromatic spices and coconut that will give it a rich, tropical flavor. You will love the taste and aroma. Kashmiri cuisine is truly unique and a work of art, something one must try in their life. Kashmiri lamb kebobs is a signature dish of the Kashmiri cuisine and lamb is often the highlight of a Kashmiri meal. The exquisite taste of this dish comes from my secret masala recipe. 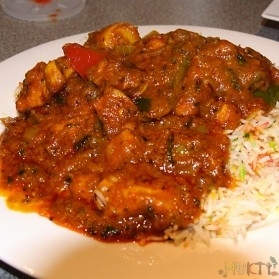 Curry dishes are always a favorite in Indian cuisine, the deep and savory flavors come from the blend of spices. Mung lentils curry is a dish that one must try for a down to earth experience. The savory curry flavor combined with an earthy flavor from the mung lentils will indulge one’s heart and mind. A lot of heavy and savory dishes can be a little overwhelming, so the next two dishes, Dahi Okra and pulao will balance our palates. Dahi okra is an easy dish cooked with onions, ginger, and yogurt masala; the refreshing taste from the yogurt masala and the light flavor from the okra will balance this whole menu out. Lastly, we will be making pulao, a rice dish consisted of mixed vegetables, cashew, and raisin. This rice dish will calm your palates down with the lightness of the rice and it’s sweet flavors from the raisin. After cooking all the above dishes, we will sit down together, and enjoy the wonderful meal we just cooked.